Choose Value Series and make the right choice to connect the HDMI signal from your DVD player to your TV or projector. 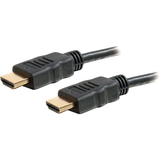 This quality-made cable can deliver a crisp, clear audio/video signal for less. The cable's construction provides the quality needed for a clean 1080p picture. Gold-plated connectors ensure long-lasting, dependable connections while the PVC jacket adds flexibility and durability. The fully molded connectors provide excellent strain relief.